I just returned from a brisk nighttime walk to the post office to drop off the latest edition of my paper zine, Ray X X-Rayer #100. My walk was brisk not because of excessive energy on my part: quick movement was required because it's freakin' 10 degrees F/-12 degrees C outside. Back in February 1994 – I don’t remember the eXact date – I launched my zine. (I pick Groundhog Day as an arbitrary date for the first issue.) Twenty years and 100 issues later and I’m wondering how I managed to keep it going for so long. Over time my writing shifted from zining to blogging this stuff first, then slapping together some posts into a paper format. I’ve almost given up along the way – that’s why my output isn’t prolific. I think what helped me was not deciding to published on a definite schedule; I decided to write when inspiration struck me. Ergo the long gaps between zine editions and posts. The fun of zining – and even blogging – has faded. Maybe it’s time for a long break or a permanent one. I do enjoy the contacts I’m made along the way through zining and blogging. I’ve met some interesting people along the way but only thru snail mail or online. I wish I had the funds to do field work, meet sources face to face. But until that opportunity arises I’ll have to remain an armchair investigator. That routine gets old; I have to wait for inspiration to hit me from the sky before I’m ready to write. With the motivation flagging – it might be this winter limbo I’m slogging thru – I’m don’t want to perfunctorily pump out material. UFO researcher Curt Collins has been revamping and updating the web site, James W. Moseley, Remembered – http://www.jimmoseley.com/ . 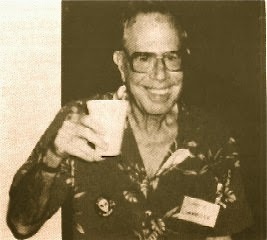 Jim Moseley was there at the beginning of ufology and for decades published a personal, sometimes controversial, newsletter covering the scene. His zine went under a few name changes until he settled on the title Saucer Smear. The memorial site provides good sources of information for anyone researching ufology (and its related sub-domain, what Jim called ufoology. I still miss my nighttime phone conversations with Jim. We've been waiting for a long time. Why haven't the benevolent space brothers revealed themselves and offered to directly help mankind? 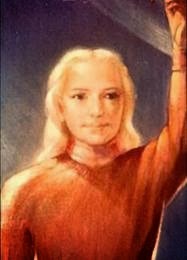 Back in the 1950s contactees like George Adamski said that they met with benevolent ETs who looked like handsome godlike humans. These space brothers passed along messages of great import like don't blow up your planet with a global nuclear war, ya morons. Orthon must have had second thoughts about helping us out. Why? I think I've uncovered the answer. The space brothers are miffed that we portray them so unfavorably in our media. 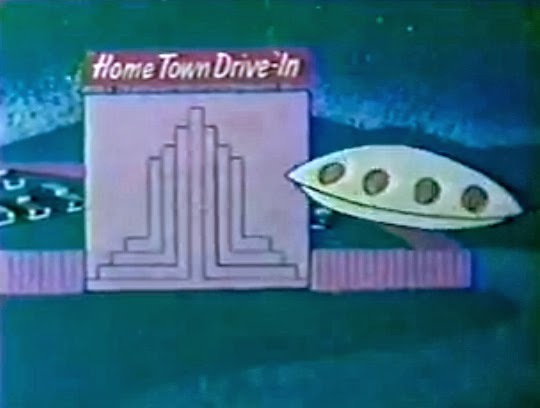 I recalled an animated drive-in intermission spot from my childhood that featured an alien visiting the snack bar during intermission. For you uninformed young 'uns out there a drive-in was once a popular medium for movies, an outdoor theater with a parking lot facing a towering screen that displayed the movies. The spaces were arranged so viewers could sit in their cars and watch. The better drive-ins had a slight hump at each space to angle up the car for optimal viewing. You listened to the movie by hanging a cabled speaker on the rolled down driver-side window. The drive-in would show more than one film. Between the main and second feature there was an intermission compelling you to enjoy the fine food at the snack bar. 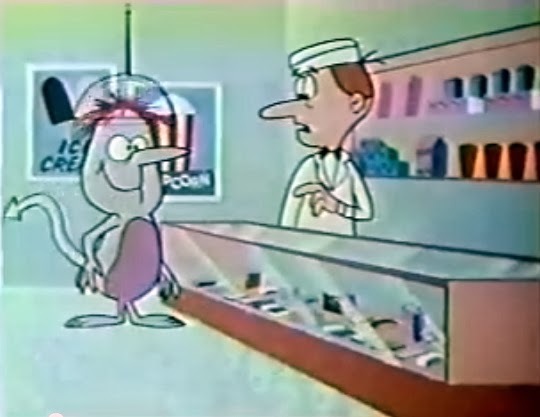 Thanks to Google I've located that alien drops in to the snack bar cartoon ad [ http://www.youtube.com/watch?v=g4u8oTQCnBI ]. 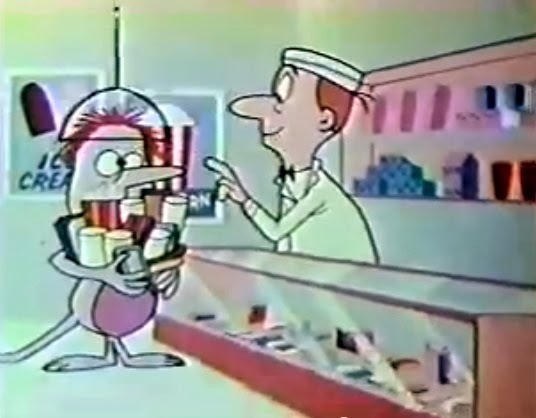 In the 55-second-long spot the alien BOING-BOING-bounces into the snack bar, startling the owner. No wonder. The alien is a pudgy green demon with a long pointy tail. He speaks in an annoying high-pitched voice. Among the items he orders the alien asks for a "cup of that nice hot liquid" – strong-as-battery-acid coffee – and two bags of "that peculiar white puffy material" – greasy popcorn. Throw into the mix fatty hot dogs with sugary candy bars and soda and you have a meal that a human being would have trouble safely absorbing, let alone an alien. Can you imagine this: an alien with three hearts who needs triple triple bypass surgery? 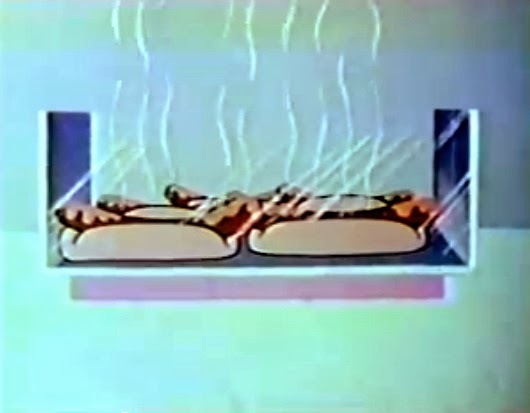 I wonder how many of our outer space visitors did check out a drive-in snack bar and ended up hurling in their flying saucers as they hurled away from Earth. As the ad wraps up the alien grabs his haul, saying his saucer is parked outside, and he bounces away. The snack bar owner observes that people come for miles around for his exquisite food. Such puerile humor is beneath the supremely-intelligent space brothers. Add the insult of being portrayed as a goofy green demon and it's no wonder they haven't come back. Maybe the annoyed space brothers will initiate a defamation of character suit through the law firm of Klaatu, Barada, and Nikto.